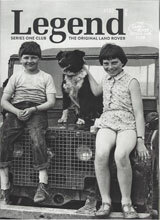 The Land Rover Series One Club was formed in 1979 by three enthusiasts who saw a need for an organisation to cater for those interested in early Land Rovers. In its infancy, the original founding members met at the Volunteer Inn, Seavington St Michael, Somerset and published 4 Newsletters a year using a type-writer and duplex machine, hand filling envelopes. 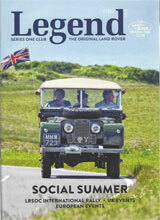 The Club is now the largest Land Rover club in the world with over 3,000 members and continues to go from strength to strength. Our main aim is to further interest in the maintenance, usage and restoration of Series One Land Rovers, through research and technical help, and to assist in the location of spares and expertise. We try and meet these objectives through the club magazine, now known as "Legend" and through this web-site, our facebook and twitter pages and our associated mobile App. In addition to a management Committee, the Club has a worldwide network of Area Representatives who may be contacted by members to organise meets with other enthusiasts in their area and are usually able to help with local sourcing of spare parts and expertise. 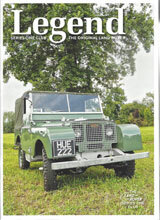 For more detailed information relating to early Land Rovers, the Club also has Technical Officers who specialise in particular models and a Registrations Officer who can assist with obtaining original and age-related registration plates for UK vehicles. Throughout the year the Club attend a number of shows around the UK and overseas. These act as a focus for members to meet socially and discuss topics relating to their vehicles and many of the events attended can be found in the Calendar on this site, updated regularly by members. Members wishing to know more about events that they were unable to attend can usually find reports published in "Legend" or they can read about them on this site in the Forum. Members are also encouraged to bring their vehicles to shows and exhibitions, no matter what condition, for display on Club organised stands. Lately the Club has undertaken to have certain parts remanufactured (see our Club Shop), particularly those which have become difficult or expensive to acquire and we hope to be able to expand this service in the future. If you'd like to join us, just visit our Membership page.